Expert learning resources for Autodesk Design Academy unlocks life-changing sustainable design thinking. A portfolio of online project-based modules and courses in 3D Design for Autodesk Design Academy. The projects apply user-centred design and sustainable practices to tackle real-world design challenges, underpinned by Autodesk's leading educational software. The courses provide in-depth project challenges for design students and educators worldwide and offer a diverse range of educational experiences. The final project scope included full design, development and authorship of all course content and learning resources, from instructor and student manuals, worksheets and step-by-step guides, to datasets, software tutorials and Design Thinking videos. 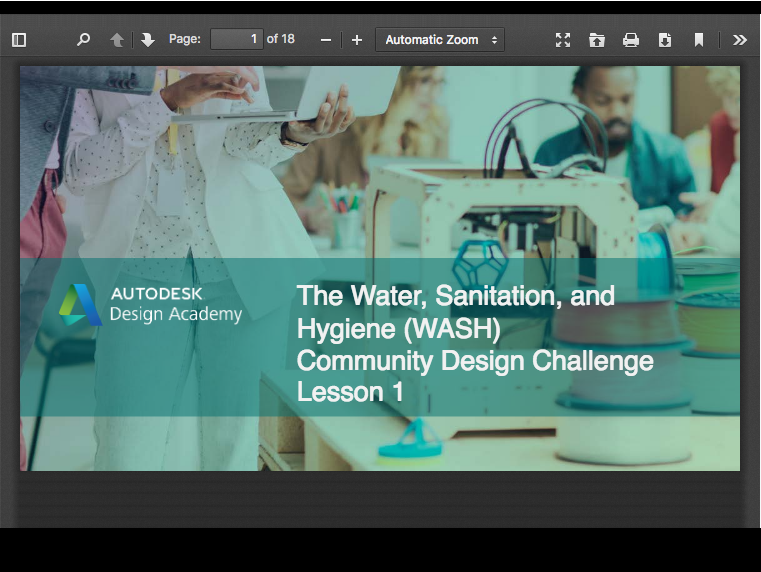 Above: The Community Design Challenge project for Autodesk Inc. An online learning Fusion 360 design course inspired by the real-world Water, Sanitation & Hygiene (WASH) Challenge in Diepsloot, South Africa. Fusion 360 Wash Community Challenge Video Software Tutorial. Above: The Community Challenge course offers a wide range of educational materials to engage learners and support academic instruction, including multiple lesson presentations and how-to video software tutorials. Above: The Prosthetic Design project for Autodesk Inc. A real-world human-centred online course exploring the design and development of an economically viable prosthetic socket for above-the-knee amputees in the developing world.